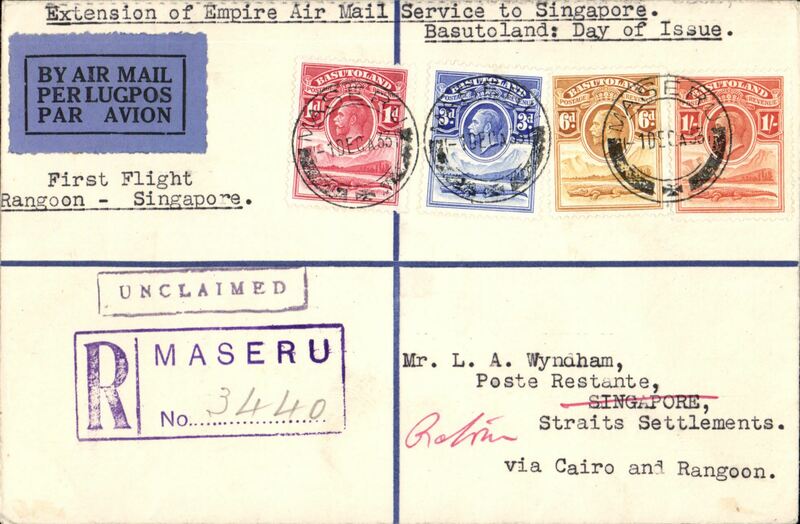 Basutoland to Singapore, bs 19/12, carried on the first flight of the imperial Airways extension from Rangoon to Singapore via Cairo, Wyndham registered (hs) cover franked FDI of the 1933 KGV 1d,3d,6d,1/-, canc Maseru/1 DEC/33 cds returned to Cape Town 'House of Parliament/23 MAR 34' cds verso. Also original certificate of posting. A superb item in fine condition.A superb item in fine condition. 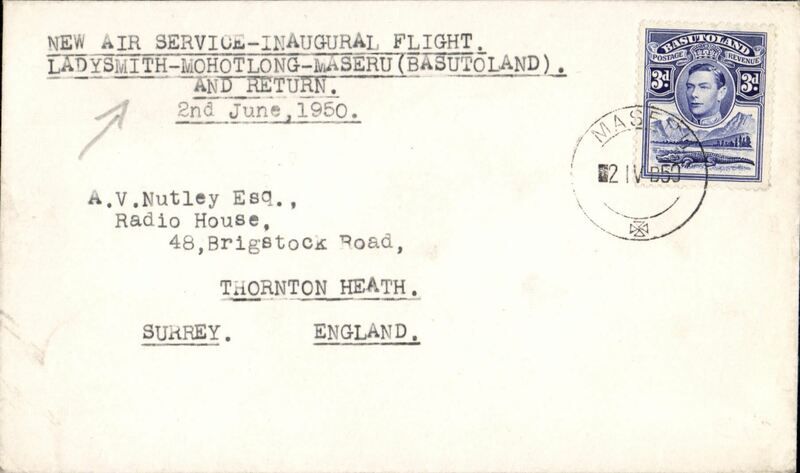 Prince George Royal Tour, first official mail to Nyasaland, card franked KGV 4d, 1d tied South African Royal Tour canceller used on arrival f Royal Train at Maseru also Maseru cds, carried by train via Bloemfontein to Johannesburg to link with Imperial Airways flight to Salisbury bs 8/3 and on 1st RANA Salisbury/ Blantyre flight bs 9/3. Lovely item. 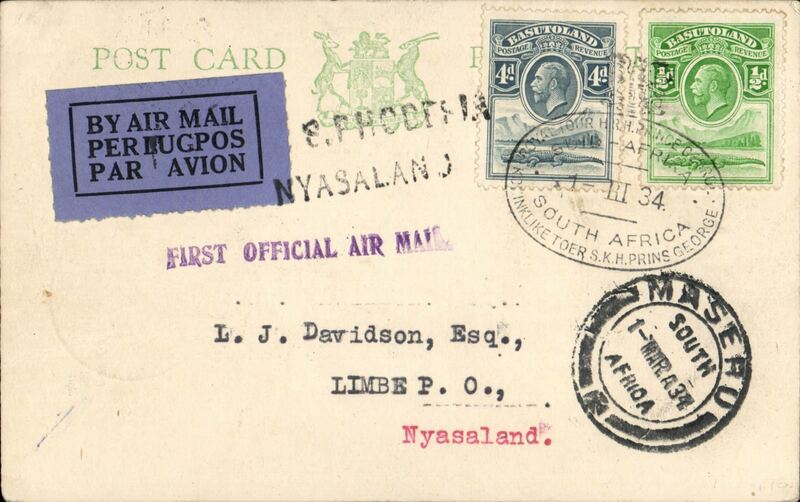 Prince George Royal Tour, first official mail to Nyasaland, cover franked KGV 1d,2d,3d, 4d, tied by South African Royal Tour canceller used on arrival of Royal Train at Maseru also Maseru cds, carried by train via Bloemfontein to Johannesburg to link with Imperial Airways flight to Salisbury bs 8/3 and on 1st RANA Salisbury/ Blantyre flight bs 9/3. Lovely item. The Visit of HRH Prince George to Southern Africa, first acceptance of mail from Basutoland for carriage on the F/F R.A.N.A. 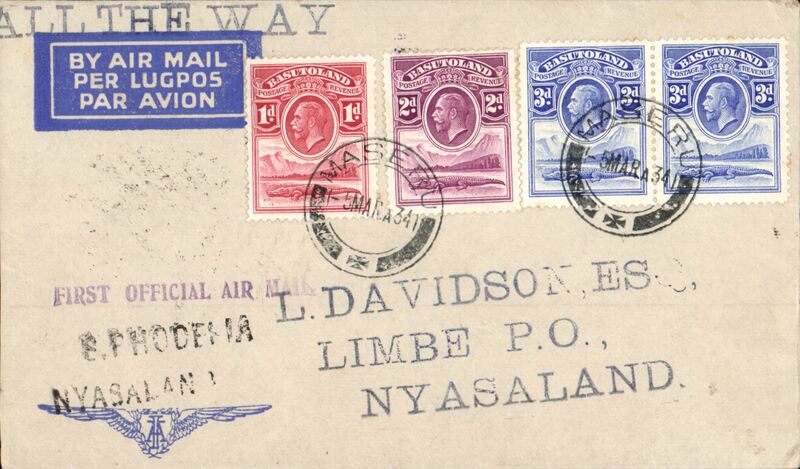 Southern Rhodesia-Nyasaland service, Maseru to Limbe, bs 9/3, via Blantyre 9/3, airmail cover franked 9d Basutoland stamps canc with special postmark of the PO attached to the Royal Train used by HRH Prince George during his visit to Southern Africa, also Maseru cds, black two line 'S.Rhodesia/Nyasaland' and violet st. line 'First Official Air Mail' hand stamps. "F/F mail from countries other than S. Rhodesia and the Union was very small because the flight was not announced outside Nyasaland and S. Rhodesia and even then only seven days notice was given"....."The most desirable covers are those posted on the Royal Train while it was in Basutoland and in the Union. The train was only in Basutoland one day and even the ordinary mail there from is scarce. 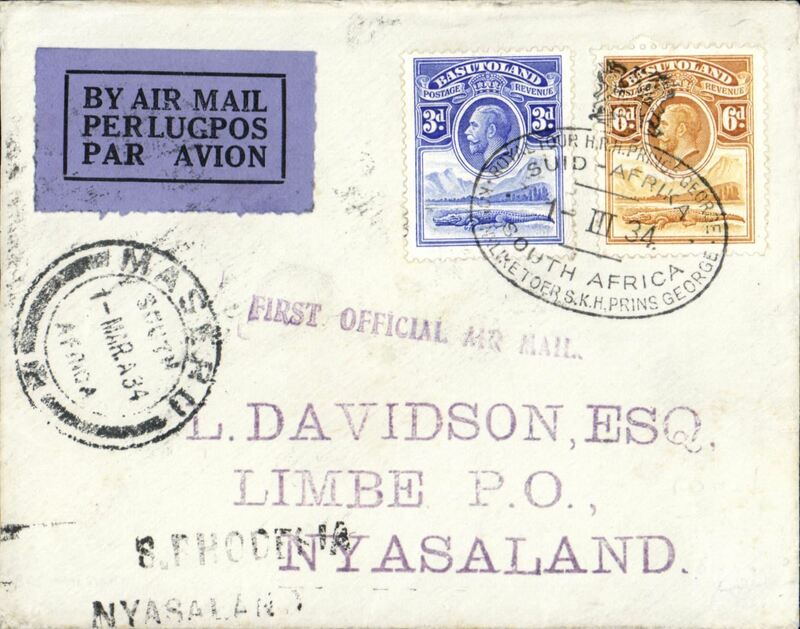 See South African Air Mails, Morton D.G., 2005, p25. A rare cover in fine condition. 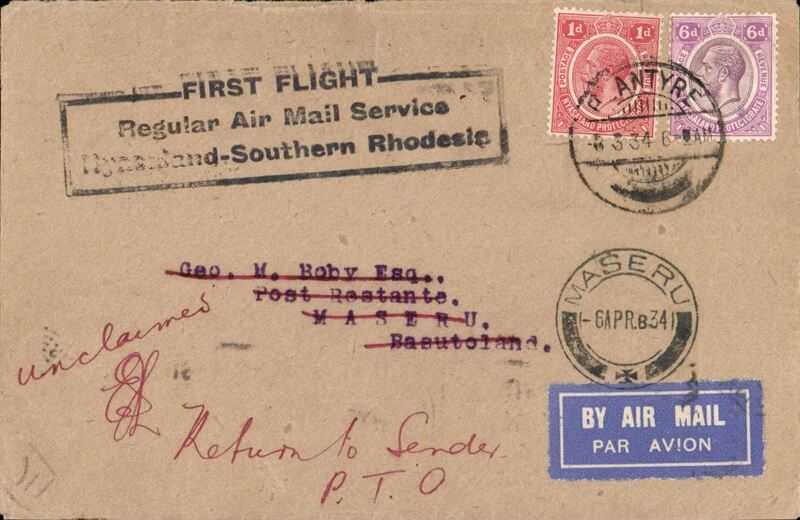 Scarce first incoming mail to Basutoland, bs 10/3, carried on the RANA F/F Nyasaland (Blantyre) to Southern Rhodesia (Salisbury), the by surface mail to Maseru. Unclaimed and returned to sender 6/4/1934. 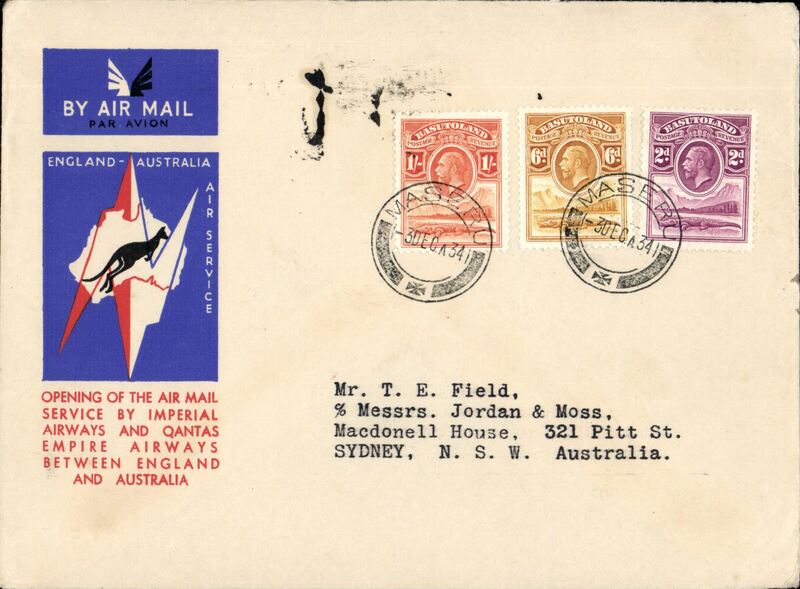 Maseru to Australia, bs Sydney 21/12, first acceptance of African 'all the way' airmail for Australia for carriage on the Imperial Airways African service to Cairo, to connect with the first extension of the IIA/ITCA/Qantas service from Singapore to Brisbane, official 'Kangaroo' cover franked 1/-, 6d and 2d, canc Maseru 3 Dec 34 cds. Scarce. 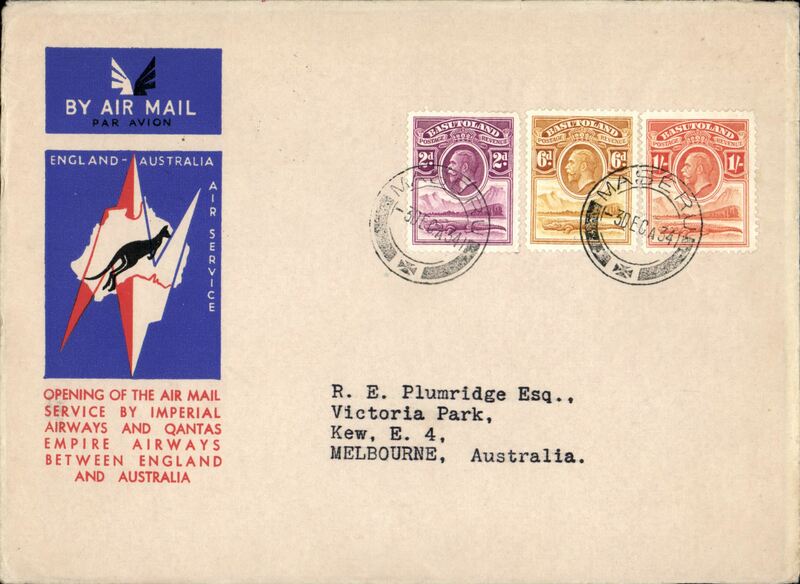 Maseru to Australia, bs Melbourne 22/12, first acceptance of African 'all the way' airmail for Australia for carriage on the Imperial Airways African service to Cairo, to connect with the first extension of the IIA/ITCA/Qantas service from Singapore to Brisbane, official 'Kangaroo' cover franked 1/-, 6d and 2d, canc Maseru 3 Dec 34 cds. Scarce. 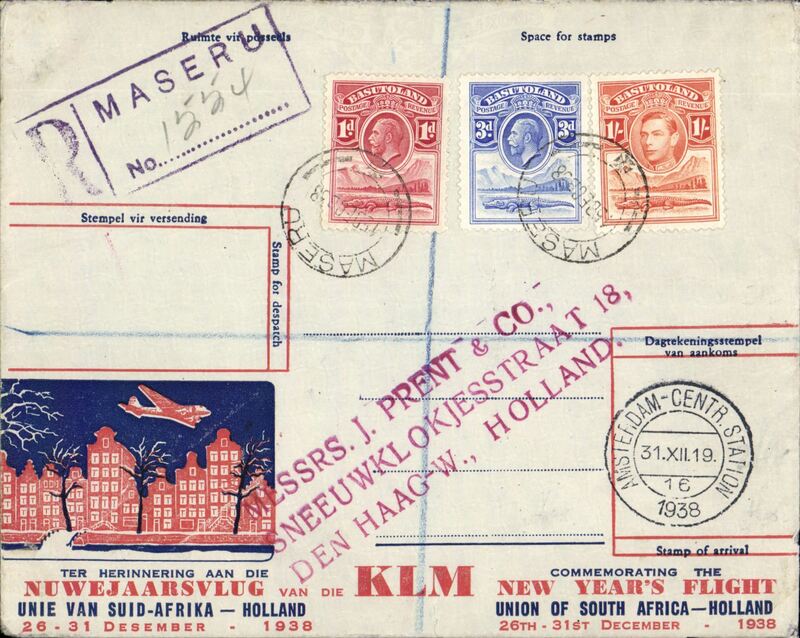 Special KLM New Year's Flight, Maseru to Amsterdam, 31/12 arrival ds on front, registered (hs) souvenir cover franked 1/-,3d, 1d GKV, carried by train to Bloemontain 16/12 transit cds and on to Johannesburg then OAT by KLM. 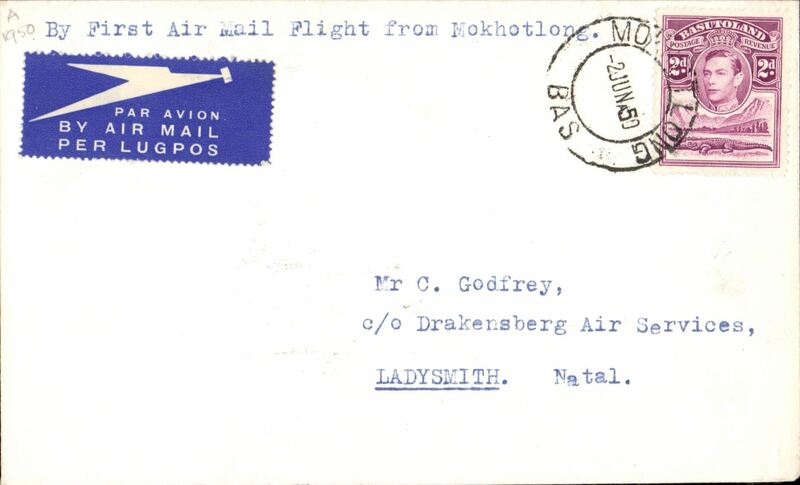 First internal, and first air connection to South Africa, F/F Maseru to Ladysmith, Natal, plain cover franked 3d, mis-cancelled 2 April, typed "New Air Service - Inaugural Flight/Ladysmith-Mokhotlong-Maseru/and Return", Drakensburg Air Services Pty Ltd.
First internal, and first air connection to South Africa, F/F Mokhotlong to Ladysmith, Natal, plain cover franked 2d, typed "By First Air Mail Flight from MoKotlong", Drakensburg Air Services Pty Ltd.